One of the most exiting recent technological advances in the field of anesthesia to track the region of interest is the introduction of anatomical evaluation by ultrasound imaging. Widespread use of this modality depends on its proven clinical efficacy, cost effectiveness, and practicality as it allows anesthesiologist to evaluate complex and varied anatomy prior to needle insertion. Sound used in medicine is not significantly transmitted by air or bone but through fluids which make up the larger part of soft tissues in the body. Ultrasound has been shown to offer excellent guidance for difficult venous access, epidural space identification in cases of difficult anatomy, delineating nerve plexuses for chronic nerve blocks, for regional anesthesia, and in transesophageal echocardiography for cardiac imaging with blood flows or in an otherwise high-risk patient where interventional procedure is required. It has special application to assess the narrowest diameter of the subglottic upper airway. A systemic literature search was performed in PubMed and the Cochrane library. The search strategy was set up using either single text word or combinations. We also included the studies where in these techniques were compared with conventional methods . Despite the initial excitement of this technique, ultrasound visualization is still indirect and images are subject to individual interpretation. It is gradually becoming routine in daily practice at our institution due to its reliability and safety. Though ultrasound is much safer, exposure in terms of intensity and time should be limited as far as possible, as high-energy ultrasound can cause heating and damage to tissues. In this review, we discuss established and future areas of ultrasound imaging and emphasize the use of B-mode ultrasound to improve the efficacy of interventional techniques. We have also illustrated potential uses with reference to cross-sectional B-mode images which visually represent a slice of tissues and are the easiest images for interpretation by clinicians. Ultrasound imaging is a simple and noninvasive technique to provide a more accurate clinical assessment and localization of area of interest. Modern ultrasound machines are more compact and portable, with better resolution and enhanced tissue penetration for identification and desired intervention in various body structures. Anesthesiologist have been performing diverse interventional procedures using anatomical landmarks over so many years with variable success rates, risks, and consequences of complications. Ultrasound has a role in vascular access, in neural access for nerve blocks and regional anesthesia, transesophageal echocardiography (TEE) for cardiac imaging with blood flows, and to assess the depth of epidural space in cases of difficult anatomy. In order to be successful with this technique, it is important to develop a thorough understanding of the sonoanatomy involved and practical skills. The normal or abnormal structures need to be imaged and interpreted before any intervention. The purpose of this review is to highlight the basics of ultrasound and to study various clinical trials in anesthesia and intensive care. Sound in the MHz range used in medical ultrasound is not significantly transmitted by air or bone. It is very well transmitted by fluids which make up the larger part of soft tissues in the body. Reflection, refraction, scatter, absorption, and transmission of sound occur as it passes soft tissue structures, allowing characterization of the shape and internal architecture of that structure in addition to those behind it. Reflection of sound is marked at interfaces between tissues of different acoustic impedance. These reflected sound signals are reproduced visually on grey scale. The pattern of sound waves generated by the probe and processing of reflected signals are controlled by computer software to generate optimal images. Transmitter generates precisely timed, high-amplitude voltage to energize the transducer and controls the rate of pulses emitted to permit sound to travel the depth of interest and return before the next pulse is sent. Transducer converts electrical energy provided by the transmitter into acoustic pulses directed into the patients and receives the reflected echoes. The receiver and processor detect and amplify the back-scattered energy and manipulate the reflected signals for display. Ultrasound imaging uses high-frequency pulses of sound waves which are generated by probes containing material exhibiting the piezoelectric effect. The crystal converts sound into electrical energy. The distance of the reflector can be calculated by calculating the time taken for the sound to travel from and to the transducer. The amplitude of the reflected sound can be used to calculate the reflectivity of the objects. Earliest A-mode devices displayed the position and strength of a reflecting structure as a vertical deflection on the face of the oscilloscope. M-mode ultrasound displays echo amplitude and shows the position of moving reflectors. It is used in the evaluation of cardiac chambers, valves, and vessel walls. Real-time B-mode display uses multiple ultrasound pulses to generate a two-dimensional (2-D) image. Generation of different-shaped field views depends on configuration of the probe. Resolution refers to the ability of the device to differentiate two closely situated objects as distinct structures. Axial resolution is measured along the axis of the ultrasound beam in its direction of propagation. It is directly proportional to the ultrasound frequency. Transverse resolution is measured at 90 degrees to axial resolution. It depends on the width of the pulse beam. Axial resolution is always superior of the transverse resolution. The correct frequency transducer should be selected depending on the depth of penetration and the resolution needed. The high-frequency (10-14 MHz) transducers produce higher resolution images with low tissue penetration. The low-frequency (4-7 MHz) sound wave will show higher penetration in tissues but with poor image resolution. They are required for localization of deeper structures. The depth of tissue should be selected as with greater depth, structures appear smaller but cover a wider area. For optimum image, the area of interest should be within the focal area of the ultrasound beam. Sterility during invasive procedures is maintained by covering the probe with a sterile plastic or latex sheath. Sterile or nonsterile gel is used to provide coupling of sound between probe and skin surface. Other gels, such as KY jelly or lidocaine gel, used for urinary catheterization may be too fluid for optimum effect. 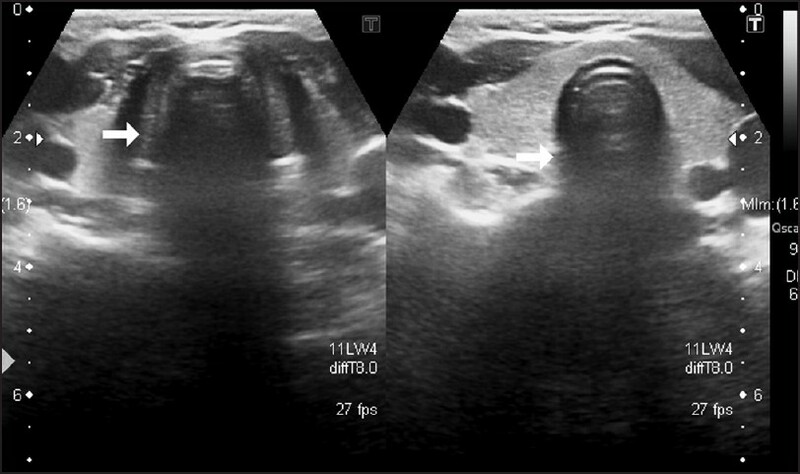 With B-mode ultrasound, structures can be seen in transverse and longitudinal section to allow three-dimensional image. In general, needles are seen more easily in longitudinal section; however, the relationship of the needle tip to target and adjacent structures is better seen in transverse section. Tissue distortion produced with repeated movements of the needle or acoustic shadows give a guide to needle direction in the absence of a direct view. The image of needles or cannulae can be improved by incorporating a machine roughened surface to improve scatter of ultrasound. Many ultrasound probes incorporate either fixed or detachable guides to facilitate accurate insertion of needles. These guides may be used in conjunction with target lines generated on the ultrasound image. The angles of these guides may be rather acute. Needle position and puncture of structures can be seen in real time. Depth and gain settings were adjusted as necessary to optimize the image quality in each patient. Depth and size of structures can be measured by built-in electronic caliper. The potential areas of ultrasound interventions in anesthesia are the airway assessment, for vascular access, for regional anesthesia and nerve blocks, pleural drainage, TEE, trauma, urinary catheterization, and nasogastric tube placement. The majority of such procedures are performed using surface markings alone for anatomical guidance. Obscured or pathologically altered anatomy can make procedures difficult and surface landmarks may give no indication of the underlying anatomy. Multiple attempts have been shown to be associated with increased risk of complications. The ability to visualize cross-sectional images during invasive procedures provides a unique opportunity of success for both normal and variant anatomy. Use of ultrasound to view anatomy and guide interventions would improve the overall success with reduced complication rates. 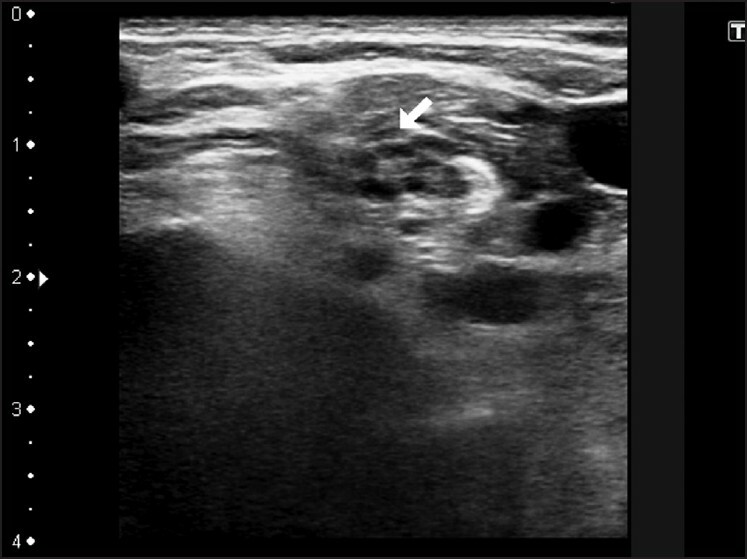 Ultrasound imaging indicates the presence, patency, position, and direction of vessels in the neck, axilla, antecubital fossa, femoral triangle, and other sites with reduce complications. There is increasing evidence that many complications can be avoided by the use of ultrasound for vascular access. There are increasing number of medico-legal cases due to the complications and failure of procedures which can be avoided by the use of ultrasound for imaging during vascular access, particularly in high-risk, difficult cases. Surface landmark-guided venous access is a procedure with high success rates when performed in optimal circumstances. The indications, techniques, and complications of vascular access are well documented. The following two types of ultrasound guidance are described: 2-D imaging ultrasound guidance and audio-guided Doppler ultrasound guidance. 2-D ultrasound provides a real-time image of the anatomy. Audio-guided Doppler ultrasound helps to localize the vein and differentiate it from its companion artery, but does not give the idea about the depth of the vessel. The majority of ultrasound studies have been performed in relation to central venous rather than arterial access. A meta-analysis of randomized controlled trials evaluating the effect of ultrasound guidance for central venous catheter placement was conducted and they found a reduction in placement failure, decreased need for multiple attempts, and decreased complications, when compared with standard landmark technique. The discrepancy in diameter between right and left internal jugular veins and inverse correlation between the size of external and internal jugular veins has been reported. The difference between the 2-D ultrasound method and the landmark method in the time taken to insert the catheter successfully was small and not statistically significant. 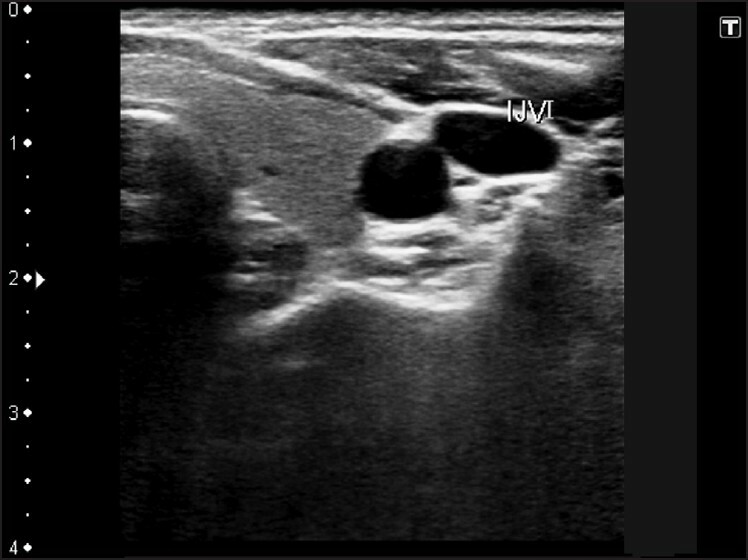 The presence of the clavicle limits ultrasound access to the subclavian vessels. Ultrasound may be used to image and guide axillary vessel puncture more laterally and reduce the risk of pleural or arterial puncture [Figure 1]. The vessels can be seen in the presence of hematoma, morbid obesity and other abnormalities, and optimum site for access chosen to avoid veins overlying arteries. This may be particularly useful in hemodialysis patients, high-risk and difficult patients who need large- bore dual lumen catheters, present for repeated cannulation, may not be able to lie supine, and may have underlying coagulopathy or platelet dysfunction. Valves and thrombi can also be located. Ultrasound can also be used as an alternative to X-ray to check for position of the guide wire or catheter being in the vessel. It can demonstrate the presence of a thrombus, seen as echogenic material which prevents the vein from being completely compressed by probe pressure. Ultrasound assessment of compressibility of lower limb veins without Doppler has been shown to be accurate in the diagnosis of deep vein thrombosis. The pulmonary embolism from upper body veins can also be recorded. Arterial cannulae are inserted for blood pressure monitoring and blood gas sampling. Studies comparing the use of ultrasound vs blind technique for radial artery cannulation have found that ultrasound guidance decreases the number of attempts and improves the overall success rate of cannulation. Some authors have noted the usefulness of ultrasound in patients in the emergency room or when femoral arterial pulsation cannot be felt during resuscitation. Color Doppler probes may be used to identify the bleeding points in arteries after arterial cannulation. Accurate ultrasound-guided local pressure can then be applied to stop bleeding and avoid or treat false aneurysms. There is also interest in intraoperative use of ultrasound to identify aortic plaques before aortic cannulation in cardiac surgery, which may reduce embolic complications during surgery. One of the principal challenges of regional anesthesia is the unreliability of conventional modalities for confirming precise nerve localization. A successful regional block requires optimum distribution of local anesthetic around nerve and plexus structures. In recent years, real-time ultrasound guidance has been introduced as an aid to nerve localization. For ultrasound-guided nerve block, all the anatomical structures in the target area have to be visualized. The penetration depth, the frequencies, and the position of the focal zones are optimized. The penetrance and reflectance of nerve tissues to ultrasound is little different to muscle and other soft tissue and larger nerves can be seen, especially when the position of blood vessels or other structures adjacent to them allow approximate prior localization. Ultrasound of peripheral nerve allows imaging of individual nerves, position of needle, and monitoring of local anesthetic spread. Higher frequencies (10-14 MHz) give a higher spatial resolution with low tissue penetration and are better for localizing superficial plexuses. Lower frequencies (4-7 MHz) are required for localization of deeper nerves. The visibility of the needle on ultrasound is affected by the angle of insertionreduced at steep angles and the gauge of the needle- large bore needle is easily visualized. The out-of-plane needle approach involves insertion of the needle, so that it crosses the plane of imaging near the target. Direct imaging of nerves allows more accurate needle placement, targeted injection of local anesthetic agent, and verification of spread in the appropriate tissue planes. The needle tip can be guided toward the neurovascular bundle, aiming specifically to avoid arteries, veins, and other structures. Once the needle is optimally in place, the local anesthetic is administered under direct visualization. If the local anesthetic does not spread in the right direction, the needle can be repositioned accordingly. Accurate needle placement would reduce the incidence of pneumothorax, arterial puncture, and direct nerve damage. A number of clinical studies have been done to examine block characteristics with ultrasound guidance at different anatomical locations, and found improved block characteristics with decreased onset time and improved quality of block. The required dose of local anesthetic was also reduced. Complications like neurological damage and vessel puncture were avoided. There are reports suggesting that ultrasound improves the success of axillary, brachial, and femoral nerve blocks. Other nerve blocks, such as that of the sciatic nerve, which traditionally has not been easy to locate, may be a focus of increased interest if they could be seen directly. Ultrasound for lumber epidurals should be used along with loss of resistance techniques to guide needle orientation and to give an idea of the depth of ligamentum flavum. Studies have shown good correlation between ultrasonographically measured data on the depth of the lumbar epidural space and direct measurement at the time of lumbar puncture. A preprocedural ultrasound scan of lumbar spine has been shown to be beneficial in guiding lumbar epidural catheter insertion Also, the depth of the epidural space in adults needs imaging with low-frequency probes, which gives poor resolution. In such anatomical areas, imaging of muscle-fascial planes or muscle-tendon bone interfaces, rather than nerve itself, may be used to guide needle placement. Ultrasound guidance is associated with significant reduction of the puncture attempts, with more precise application of the catheter to improve analgesia quality with patient satisfaction. Ultrasound visibility is higher in the paramedian as compared with the median plane and should be used to determine the least rotated vertebral body for epidural catheter insertion in spinal scoliosis. Newer application of ultrasound is to visualize the cerebrospinal fluid leak in cases of postdural puncture headache and to apply autologous blood epidural patch. Ultrasound imaging of the upper airway, in a cooperative subject without the need for sedation, could provide another objective modality to anesthesiologists to assess the size of the airway, the presence of foreign bodies, and perhaps the condition and structure of the epiglottis. The ability to measure airway dimensions is important for clinicians and interventional bronchoscopists to accurately quantify structural abnormalities in response to treatment. A fast, simple, and noninvasive sublingual technique  for ultrasonographic airway imaging, well tolerated by awake, cooperative adult patient, has been studied by placing a small footprint, high-frequency curved array probe into the sublingual fossa, intraorally. It gives clear images of oropharyngeal and glottic structures. A longitudinal view of the larynx can be obtained by placing the probe sagittally and longitudinally under the patient's tongue. Excellent probe-tissue contact is achieved by placing the probe into the sublingual fossa. This approach provides stable images while avoiding contact with the soft palate and circumventing an unpleasant gagging reflex. The images of the larynx can be optimized further by tilting the probe upward and pointing it caudally. The epiglottis is typically located caudal to the base of the tongue. A clear and dynamic view, as well as the opening of the esophagus, can usually be easily obtained by asking the patient to swallow. Ultrasound has been used in the diagnosis of maxillary sinusitis in nasally intubated cases. The presence of fluid in the sinuses allows their structure to be visualized which could not be seen when air filled. The role of ultrasound in and around the airway requires further verification. It is useful aid to verify epidural placement of local anesthetic agents and epidural catheters in children. Advantages include a reduction in bone contacts, faster epidural placement, direct visualization of neuraxial structures, and the spread of local anesthetic inside the epidural space. Studies have shown that ultrasound provides information on the distance of skin to ligament flavum in neonates, infants, and children. Hence, the risk of dural puncture is reduced and the spread of local anesthetic agent can also be visualized. The use of ultrasound has been shown to have 100% accuracy in locating the caudal space and guiding epidural needles for caudal injections for low back pain. Ultrasound has been shown to offer excellent guidance in selective ganglion or nerve blocks for invasive pain therapy. 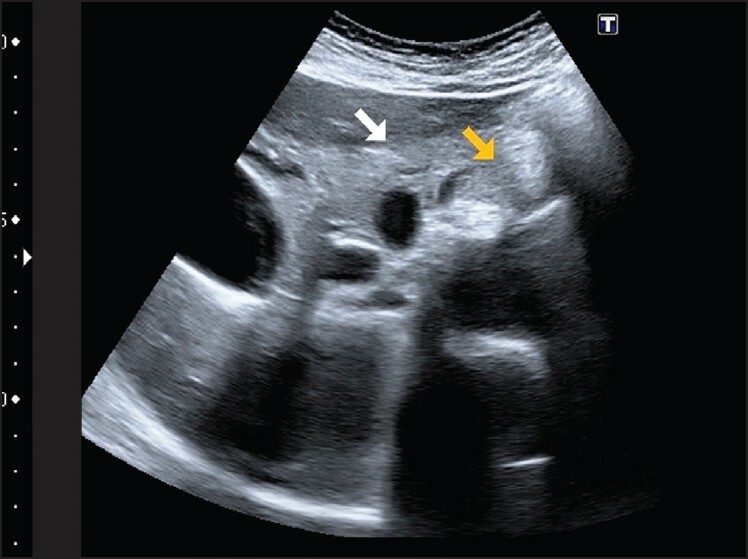 Lumber sympathetic and celiac plexus have been shown to yield similarly good results with ultrasound imaging as with computed tomography scans. 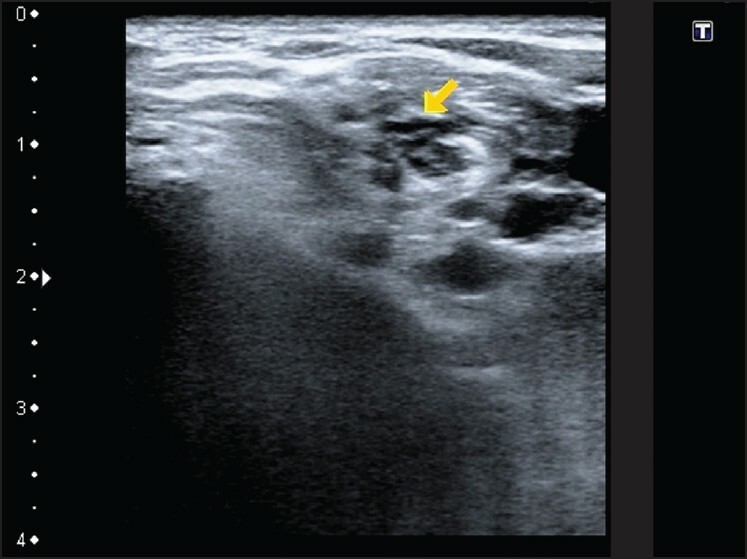 A new ultrasound-based approach to facet nerve block under guidance is simpler and avoids radiation. Ultrasound guidance for stellate ganglion block is useful to monitor the puncture site, needle position, and spread of the local anesthetic. The stellate ganglion block is commonly given for treatment of hydrohidrosis or complex regional pain syndrome of the upper limb. Traditional landmark techniques use an anterior paratracheal approach at C 6 with palpation of Chassaignac's tubercle in the groove between the trachea and the sternocleidomastoid muscle. The injection at the base of the transverse process where it joins the vertebral body has been recommended. The ultrasound may be used to identify myofascial trigger points. In the area of chronic pain, demonstration of neuromas or nerves infiltrated by tumor may offer new diagnostic or treatment opportunities. Currently, magnetic resonance imaging and other imaging modalities are more widely used for this purpose. Ultrasound-guided anesthetic procedures have given a new life to traditional skills. The superiority of ultrasound-guided block technique to blind techniques relies on subtle sensations, which may be unreliable even in experienced hands. The noninvasive real-time imaging of the relevant anatomical structures with the needle is placed under direct vision and the spread of local anesthetic can be seen within the potential space, with faster onset times, reduced doses of local anesthetic, and higher and more predictable success rates, particularly in the more difficult cases. Needle misplacement can be recognized and rectified immediately reducing the risk of failure or potential complications. The increasing availability of small, high-resolution ultrasound and its utility in vascular access, TEE, and regional blocks has led a potential role in anesthesia, intensive care, and pain areas. Routine application of this technology may ultimately increase the overall utilization rate. 1. Merritt CRB. Physics of Ultrasound. In: Rumack CM, Wilson SR, Charboneau JW editors. Diagnostic Ultrasound. St Louis,: Mosby; 1998. p. 3-33. 2. Taylor PM. Ultrasound for anaesthetists. Curr Anaesth Crit Care 2003;14:237-49. 3. Maecken T, Grau T. Ultrasound imaging in vascular access. Crit Care Med 2007;35:S178-85. 4. Hind D, Calvert N, McWilliams R, Davidson A, Paisley S, Beverley C, et al. Ultrasonic locating devices for central venous cannulation: Meta analysis. BMJ 2003;327:361- . 5. Lomas DJ, Padley SG, Flower CD. 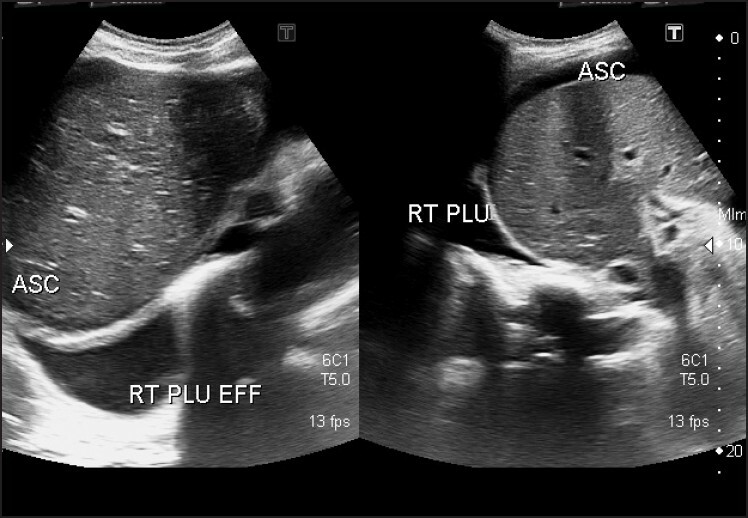 The sonographic appearances of pleural fluid. Br J Radiol 1993;66:619-24. 6. Ma OJ, Mateer JR. Trauma Ultrasound examination versus chest radiography in the detection of hemothorax. Ann Emerg Med 1997;29:312-5. 7. Lichtenstein D, Meziere G. A lung ultrasound sign allowing bedside distinction between pulmonary oedema and COPD: The Comet-tail artifact. Intensive Care Med 1998;24:1331-4. 8. Yu CJ, Yang PC, Chang DB, Luh KT. Diagnostic and therapeutic use of chest sonography: value in critically ill patients. AJR Am J Roentgenol 1992;159:695-701. 9. Gottesman E, McCool FD. Ultrasound evaluation of the paralyzed diaphragm. Am J Respir Crit Care Med 1997;155:1570-4. 10. Dureja GP. Guidance in regional anesthesia: Is it the gold standard? Editorial. J Anaesth Clin Pharmacol 2007;23:119-20. 11. Oldman MJ, Nicholls BJ. Imaging techniques and regional anaesthesia. Curr Anaesth Crit Care 2004;15:255-61. 12. Gray AT. Ultrasound guided regional anaesthesia. Anesthesiology 2006;104:368-73. 13. Marhofer P, Greher M, Kapral S. Ultrasound guidance in regional anaesthesia. Br J Anesth 2005;94:7-17. 14. Beach ML, Sites BD, Gallagher JD. Use of a nerve stimulator does not improve efficacy of ultrasound-guided supraclavicular nerve blocks. J Clin Anesth 2006;18:580-4. 15. Furness G, Reilly MP, Kuchi S. An evolution of ultrasound imaging for identification of lumbar vertebral level. Anaesthesia 2002;57:277-83. 16. Grau T, Leipold RW, Horter J, Conradi R, Martin E, Motsch J. The lumbar epidural space in pregnancy: visualization by ultrasonography. Br J Anesth 2001;86:798-804. 17. McLeod A, Roche A, Fennelly M. Case series: Ultrasonography may assist epidural insertion in scoliosis patients. Can J Anaesth 2005;52:717-20. 18. Bohme G. Clinical contribution to ultrasound diagnosis of the larynx (echolaryngography). Laryngorhinootologie 1989;68:510-5. 19. Werner SL, Smith CE, Goldstein JR, Jones RA, Cydulka RK. Pilot study to evaluate the accuracy of ultrasonography in confirming endotracheal tube placement. Ann Emerg Med 2007;49:75-80. 20. Tsui BC, Hui CM. Sublingual airway ultrasound imaging. Can J Anesth 2008;55:790-1. 21. Bertram S, Emshoff R, Norer B. Ultrasonographic anatomy of the anterior neck: Implications for tracheostomy. J oral Maxillofac Surg 1995;53:1420-4. 22. Friedman EM. Role of ultrasound in the assessment of vocal cord function. Ann Otol Rhinol Laryngol 1997;106:199-209. 23. Lakhal K, Delplace X, Cottier J, Tranquart F, Sauvagnac X, Mercier C, et al. The feasibility of ultrasound to assess subglottic diameter. Anesth Anaig 2007;104:611-4. 24. Lichtenstein D, Biderman P, Meziere G, Gepner A. The sinusogram, a real time ultrasound sign of maxillary sinusitis. Intensive Care Med 1998;24:1057-61. 25. Rubin M. Cardiac ultrasonography. Emerg Med Clin North Am 1997;15:745-62. 26. Rapp H, Grau T. Ultrasound guided regional anaesthesia in paediatric patients. Tech Reg Anesth Pain Manag 2004;8:179-98. 27. Marhofer P, Bosenberg A, Sitzwohl C, Willschke H, Wanzel O, Kapral S. Pilot study of neuraxial imaging by ultrasound in infants and children. Paediatr Anaesth 2005;15:948-52. 28. Willschke H, Marhofer P, Boesnberg A, Johnston S, Wanzel O, Sitzwohl C, et al. Epidural catheter placement in children: Comparing a novel approach using ultrasound guidance and a standard loss of resistance technique. Br J Anesth 2006;97:200-7. 29. Willschke H, Bosenberg A, Marhofer P, Johnston S, Kettner SC, Wanzel O, et al. Ultrasonography-guided rectus sheath block in paediatric anesthesia-a new approach to an old technique. Br J Anesth 2006;97:244-9. 30. Kapral S, Krafft P, Gosch M, Fleischmann D, Weinstabl C. Ultrasound imaging for stellate ganglion block: direct visualization of puncture site and local anaesthetic spread. A pilot study. Reg Anesth 1995;20:323-8. 31. Bynoe RP, Miles WS, Bell RM, Greenwold DR, Sessions G, Haynes JL, et al. Noninvasive diagnosis of vascular trauma by duplex ultrasonography. J Vasc Surg 1991;14:358-68. 32. Campbell IT, Watt T, Withers D, England R, Sukumar S, Keegan MA, et al. Muscle thickness, measured with ultrasound, may be an indicator of lean tissue wasting in multiple organ failure in the presence of edema. Am J Clin Nutr 1995;62:533-9. 33. Heller M, Melanson SW. Applications for ultrasonography in the emergency department. Emerg Med Clin North Am 1997;15:735-44. 34. Thomas B, Falcone RE, Vasquez D, Santanello S, Townsend M, Hockenberry S, et al. Ultrasound evaluation of blunt abdominal trauma: program implementation, initial experience, and learning curve. J Trauma 1997;42:384-90.